Lewis Bean says helping Birmingham Moseley stay in National One would be the perfect ending before he joins Northampton Saints next season. 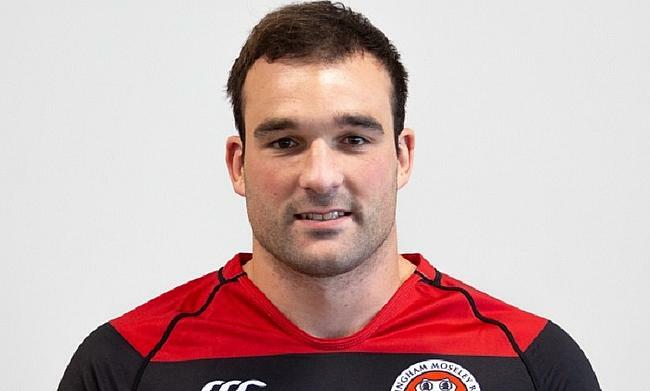 The second-row has been with Moseley for two years and it was announced earlier this month that Bean would be moving to Franklin’s Gardens for the 2019/20 campaign. As things stand in National One, Moseley are four points clear of the bottom three with two matches remaining. Richard Protherough’s side conclude the campaign at home against relegation-threatened Caldy on April 27th, but first up, is a huge clash with Cambridge this weekend. The Blood and Sand are just two points above the drop zone so victory in Round 29 could prove pivotal for either Moseley or Cambridge as they fight for survival. Bean will be hoping Moseley come away from Volac Park with the crucial points as this will be the lock’s final match for the Midlands club before he departs for the Gallagher Premiership. “I was over the moon when Saints offered me a contract,” Bean said. “It is obviously great to get signed and I have just got to work hard now and get moving forward with Saints. “For Moseley, this game this weekend is absolutely massive. Me and the rest of the team know how important it is for us and the club. “I know one of the forwards coaches at Cambridge. I was speaking to him the other night and this game has got a lot riding on it. I reckon it is a make or break game. After impressing in his maiden season for Moseley in 2017-18, Bean began this campaign training with Worcester Warriors. He featured for the Warriors in the Premiership Rugby Cup and Premiership Shield, but in December, he was lining up against Worcester for Northampton after the Saints had offered him a two-week trial. Bean also revealed he was in talks with Harlequins and Leicester Tigers, but Franklin’s Gardens will be his home next season as he takes his next steps in the game. “When I was at Worcester, I was doing pre-season with them and towards the end of that, they said we have got too many second-rows and we can’t offer you a contract,” Bean said. “At that point, I got offered a contract from Quins! From there, Northampton then rang me up and asked me to come down for what effectively was a trial. I did the trial and they were happy and they offered me something straight away! “Obviously, it is amazing that people want you and I was in talks with Leicester as well! By that time, I had already been offered my contract from Saints and I am happy here. It was always going to be Northampton. Bean’s rise in the game is certainly something to be admired. In 2012, he joined the army and since then, the 27-year-old has completed two tours of duty in Afghanistan. In terms of his rugby, Bean admitted he had never really played the game but three years ago, he was asked to represent the Army against the Navy at Twickenham which seemed to kick-start his rugby journey. Bean was quick to thank the army and his regiment when the deal with Northampton was announced and he was also keen to stress how accommodating the forces are when it comes to servicemen and women being allowed to pursue high level sport. Bean added: “It is a massive thing for someone in the forces to be able to play a professional sport. Without my regiment and the army allowing me to play rugby, I wouldn’t be able to do it. “It is really good of them to let myself and other people in sport take it further. We’ve got boxers, people who do skiing; all sorts! “It is just good that the army let us do it. It is good for army rugby too because more and more of their players are playing in the Championship and Premiership so it is really good. But before he focuses on Northampton full-time, Bean will be concentrated on confirming Moseley’s safety in National One. Three victories from their last five matches against Loughborough Students, Chinnor and Esher has put them in a strong position to beat the drop and the forward knows the importance of keeping the club in the third tier. He added: “We had a talk about coming together and focusing on staying up to make sure we get the job done. I think the mindset of the players has really turned. Obviously, we want to stay up and I think we have all just pulled together.